James M. Payne is an attorney licensed to practice in Wisconsin, Pennsylvania, and New Jersey. A native of Wisconsin, he recently relocated back home after practicing law in Philadelphia for five years. Mr. Payne concentrates his practice in the areas of personal injury, employment matters, and general civil litigation. At Rizzo & Diersen, he works closely with those injured in automobile, motorcycle, slip-and-fall, dog bite, and medical malpractice accidents to find just and equitable settlements or verdicts for clients. 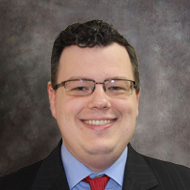 Mr. Payne works from the firm’s Old Elm Office in Kenosha, but handles cases throughout Southeastern Wisconsin, the Greater Milwaukee Area, and Northern Illinois. Some of Mr. Payne’s personal interests include the Green Bay Packers, classic movies, and politics.